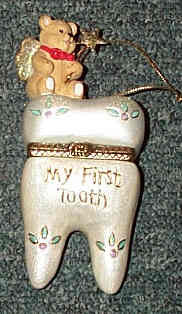 My First Tooth ornament with bear -resin; 4 1/2" resin "My First Tooth Ornament". This tooth opens up to put the child's first tooth in it. It then snaps shut. On top of the tooth sits a bear who i..
My First Tooth ornament with bear -resin; 4 1/2" resin "My First Tooth Ornament". This tooth opens up to put the child's first tooth in it. It then snaps shut. On top of the tooth sits a bear who is holding a wand. (He is the toothbeary). There is a lot of space inside the tooth so it will actually hold several teeth. This is a cute gift to give a child who has just lost his first tooth. You can use it to put money in or to put the tooth in.